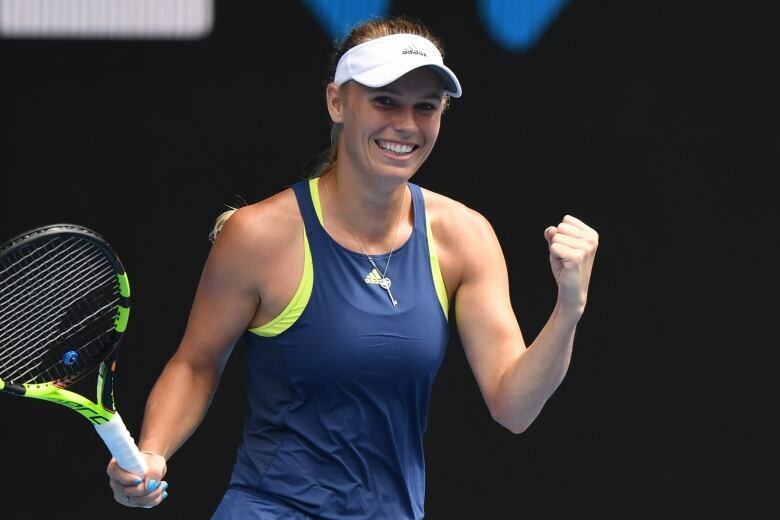 Caroline Wozniacki is continuing to cash in on her second chance at the Australian Open, reaching the quarter-finals here for the first time since 2012 with a 6-3, 6-0 win over Magdelana Rybaricova on Sunday. 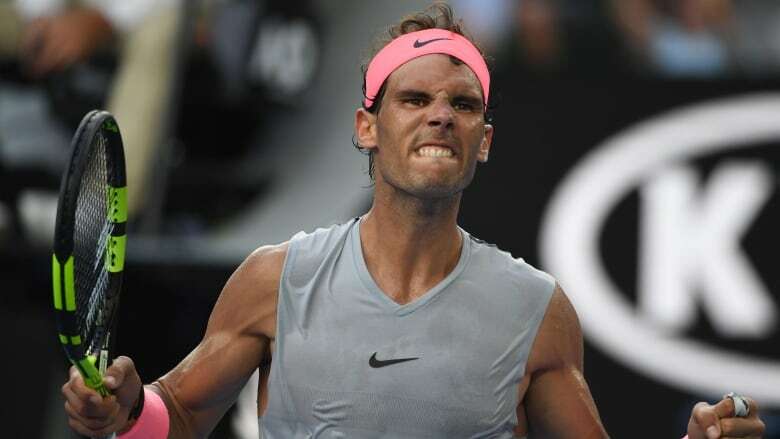 If Rafael Nadal wanted a fitness test in the first week of the Australian Open, he got one in his almost four-hour, 6-3, 6-7 (4), 6-3, 6-3 win over Diego Schwartzman. No. 3-ranked Grigor Dimitrov did it tough, too, before advancing to the quarter-finals at the expense of the last Aussie in the draw. Dimitrov avenged a loss two weeks ago to Nick Kyrgios with a 7-6 (3), 7-6 (4), 4-6, 7-6 (4) win over Nick Kyrgios on Sunday night. He'll next face Kyle Edmund, who reached his first Grand Slam quarter-final with a 6-7 (4), 7-5, 6-2, 6-3 win over Andreas Seppi earlier in the afternoon and could relax and watch the night-time entertainment. Nadal, with his spot in a 10th Australian Open quarter-final secure, draped an arm around his Argentine friend Schwartzman and patted him on top of the head after they met at the net. "A great battle ... he's a good friend of mine," Nadal said. "This is the first big match that I played in 2018. That's confidence for myself ... confidence I can resist for four hours on court at a good intensity." He didn't play a competitive match before the season-opening major, and advanced through three rounds without dropping a set. That streak finished when Schwartzman took the second set, rebounding three times after dropping serve to break back against Nadal and level the match. Nadal lifted to win the third, but Schwatzman didn't relent. The second game of the fourth set lasted almost 13 minutes and 20 points, with Nadal finally holding after saving five break points. The 16-time major winner broke again in the next game and withstood more break points — seven in all in the last set and 15 of 18 in the match — before clinching it in 3 hours, 51 minutes. "It was a good test for me. It was a lot of hours on court. Moments under pressure," Nadal said. "So, yeah, a lot of positive things that I managed well." After her close call in the second round — she had to save two match points and come back from 5-1 down in the third set — No. 2-ranked Wozniacki said she was "playing with the house money" and had nothing to lose. After a tight tussle in the opening four games against No. 19-seeded Rybaricova, a Wimbledon semifinalist last year, Wozniacki dominated the fourth-round match. She even tried a between-the-legs "tweener" from near the baseline for the first time in a tour-level match. She didn't win the point, but said it was progress. "I think you can tell my confidence is high," she said in an on-court TV interview. "I tried a tweener today and it went in." She looked at a replay on the stadium screen and joked "I'm admiring myself there." Marin Cilic won his 100th Grand Slam singles match and advanced to the quarter-finals with a 6-7 (2), 6-3, 7-6 (0), 7-6 (3) victory over Pablo Carreno Busta. The sixth-seeded Cilic won his only Grand Slam singles title at the U.S. Open in 2014 when he beat Kei Nishikori in the final. It is Cilic's 11th Grand Slam quarter-final, leaving him level with Goran Ivanisevic for most appearances by a Croatian man at that stage. Cilic's quarter-final opponent will be either 2017 finalist and top-seeded Rafael Nadal. Cilic has only beaten Nadal once in six attempts. Fourth-seeded Elina Svitolina started her fourth-round match just before midnight Sunday at the Australian Open and was finished within an hour, beating Czech qualifier Denisa Allertova 6-3, 6-0 to reach the quarter-finals here for the first time. Svitolina was ruthless in the second set, conceding only eight points in the first five games. Even when Allertova had game point at 40-0 in the last, Svitolina went on a five-point roll an closed it out with a backhand winner down the line. The result extended her winning to nine matches, including a run to the title at the Brisbane International two weeks ago. Svitolina's next match is against Elise Mertens, who is on a winning streak following a title run in Hobart last week and is into the quarter-finals on her debut at the Australian Open.